South Korean President Moon Jae-in and Czech Prime Minister Andrej Babis agreed Wednesday to further improve their countries' bilateral ties and make joint efforts to prepare the countries for the fourth industrial revolution. In a meeting in Prague, they noted the countries' relationship has steadily improved since the countries established diplomatic ties in 1990. "The two leaders ... agreed to continue expanding their bilateral trade and investment to further solidify the South Korea-Czech Strategic Partnership established in 2015 and to strengthen their mutual cooperation in various areas such as security, defense industry and people exchange," Moon's presidential office Cheong Wa Dae said in a press release. Moon and Babis stressed the importance of mutual cooperation in new, future-oriented industrial sectors, including information and communication technology and artificial intelligence. The South Korean president also asked for increased cooperation in the nuclear energy sector. "President Moon plans to ask that we be allowed to take part in the Czech Republic's nuclear energy project in his meeting with the Czech prime minister, highlighting South Korea's advanced technology and vast experience," Cheong Wa Dae said earlier. President Moon also sought Czech support for his country's efforts to peacefully denuclearize North Korea. 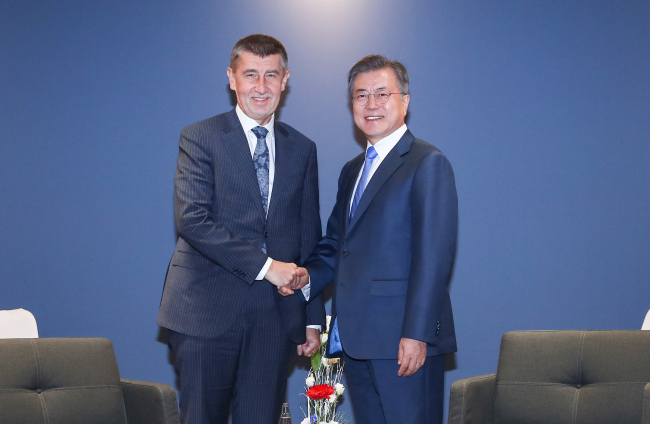 Prime Minister Babis said his country will continue to support Seoul's efforts to establish lasting peace on the Korean Peninsula, Cheong Wa Dae said, noting the Czech Republic maintains a permanent diplomatic mission in the communist North.